Even though this post is a tribute to a very special therapy dog who has just passed on, I can say with utmost certainty that he remains very much alive in spirit, and still hard at work healing hearts! Rescued mutt Baxter went from a life in which no one loved him to one in which he loved everyone. He became a therapy dog who specialized in giving comfort to patients in their final days at the San Diego Hospice and The Institute for Palliative Medicine. And having learned from the best, Baxter’s human mom, Melissa Joseph, shared his mission, and intends to continue his legacy in everything she does. 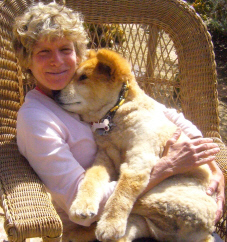 “I never really got how I could impact the world until I got Baxter,” Melissa says. Melissa chronicled Baxter’s heartwarming encounters in her book, Moments with Baxter. I had the pleasure of speaking with her today, and she told me, “I don’t feel like he was mine alone. I feel like I got to be part of a remarkable phenomenon.” Baxter passed away at the age of 19 on October 16. My “moment with Melissa” was in many ways also a “moment with Baxter:” Together, they were a six-legged team working as one. Melissa shared a recent event that revealed not only the positive impact Baxter had on his hospice friends but also Melissa’s keen sense of the best way to connect with people in times of need. Baxter was visiting the hospice on the day that a 36-year old woman who had battled breast cancer was to be transported home to die with family. The woman had come to love Baxter and had shared with staff that his visits literally removed her pain: Pain that she consistently rated at 8 out of 10 in intensity before his visits and at 0 following them. As the gurney was wheeled towards this woman’s room, Melissa asked if she could place Baxter on it. This was against the rules, the attendant told her, but Melissa continued to lift Baxter, respectfully assuring the attendant that this would be an important “moment with Baxter.” When Baxter arrived in the room on the gurney, the patient laughed and cried at once. She removed her oxygen mask and barked, “Move over, Baxter!” The newly enlightened attendant wheeled them around the hospital grounds for a playful final ride together. Everyone present was grateful for taking part and reminded of the importance of such moments. Melissa adopted Baxter when… finish the post by clicking here.